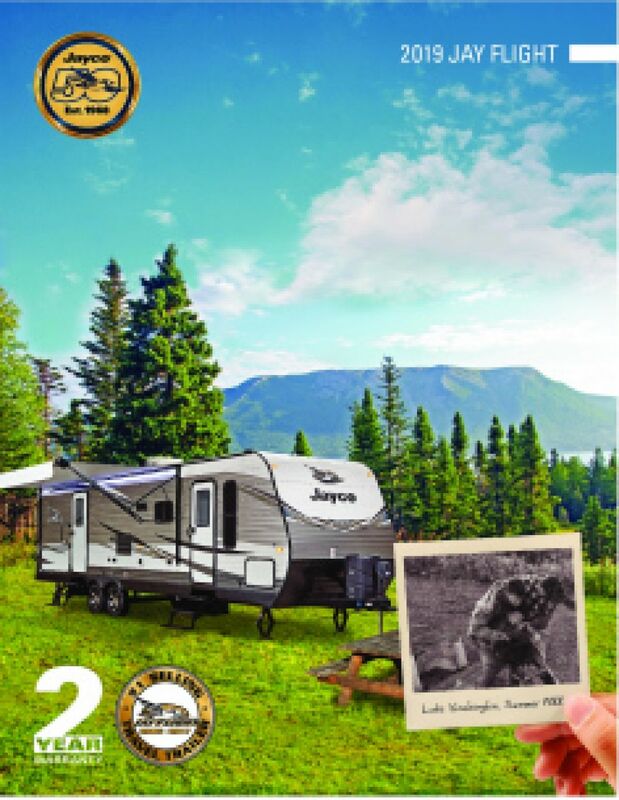 Make your next camping trip an unforgettable one in the 2019 Jayco Jay Flight 32BHDS Travel Trailer! At Tradewinds RV Center, we offer a massive inventory of top quality RVs at astonishingly affordable prices, making us one of the premier RV dealers in Michigan - and the nation! Stop on by 4325 W Vienna Rd Clio Michigan 48420 or call us at 810-686-0710 to talk to one of our friendly, knowledgeable, certified RV experts today! They'll show you how you can own your dream RV at a dream price! Don't live in the Clio area? No worries! We have satisfied customers all over North America! With our fast, reliable 24/7 delivery service, you can pick out your dream RV online and it'll be at your door in no time - and you'll save $1000s! With a hitch weight of 845 lbs. and a GVWR of 9995 lbs, this 36' 2" long, 8' 0" wide Travel Trailer is very towable and built for years of fun! The 18' 0" awning provides shade and comfort for outdoor relaxing! 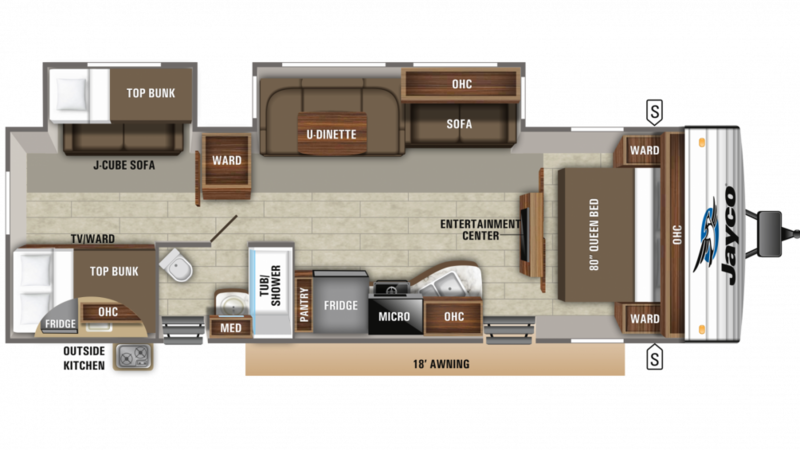 This RV feels so much like home with all the living space inside! That's due to the 2 slides that open up easily to maximize the interior, combined with a length of 36' 2", a width of 8' 0", and a height of 11' 2"! You'll stay warm and cozy when it's cold outside, thanks to the efficient 35000 BTU furnace; and the modern 13500 BTU a/c unit will keep everyone cool and fresh on those sizzling summer nights and days! No makeshift sleeping quarters for you in the Jay Flight 32BHDS! This RV sleeps 8 and comes with a spacious bedroom, handsomely furnished with storage for your clothes and sundries, and a regal Queen bed! Nothing tastes better than a delicious meal when you're on the road! Thanks to the great kitchen in this Travel Trailer, you'll enjoy them every day. The 3 burner cooktop makes hot breakfasts, lunches, and dinners a snap! And the 8.00 cu. ft. refrigerator lets you stock all your favorite foods and cold drinks! At clean-up time, the 80 gallon freshwater tank and 60 lbs. of LP tank capacity will supply you with plenty of hot water for all the dishes! Take luxurious hot showers morning, noon, or night! You'll have plenty of hot water for the entire family, thanks to the big 80 gallon freshwater tank and 60 lbs. of LP tank capacity! The 33 gallon gray water tank along with the 39 gallon black water tank provide ample storage for used water and waste, saving everyone the inconvenience of trekking to the campground community bathroom! The easy to use Porcelain Foot Flush toilet is a boon too! With its handy bunkhouse and Bunkbeds, this Travel Trailer has comfortable sleeping space for the whole family! Kids will love snuggling down under the covers and drifting off to dreamland! There is an outdoor kitchen, where you can whip up delicious meals for big game tailgatings or a lovely picnic out in the fresh air!